For months, I have been waiting for Jason to meet me in Istanbul so we could explore Turkey and travel to Kurdistan in Northern Iraq. This wasn’t the first trip we’ve taken, but it was our first international adventure, and I knew it was important because being able travel well as a team would influence future plans we made. Traveling with another person is a big deal to me. There are many people I love, but in all honesty, the groove needed to travel with another person… especially to less-developed locations…is something I can’t imagine with most. There are too many factors to consider…too many opportunities for things to go wrong…traveling gets really personal…and I like the freedom of being alone. I wondered if the last months had made me too independent to travel with someone else. After all, I decided everything about my recent days, with no consideration of the needs of others. I slept when I was tired…ate when I felt hungry… made a new friend when I felt social…and was pretty quiet the rest of the time. It has been all about me and now I was delving into a new area of partnership and communication. It was exciting and in the days leading up to the trip, I reveled in the blessing of dating someone who was also excited about visiting Iraq. In most cases, people look at me with alarm when they hear about destinations like this, but we were both anxious to be welcomed by people of Erbil. I waited at the airport for Jason’s arrival in Istanbul! Airports are emotional places-especially for welcomes and goodbyes-I have learned they are much more pleasant when welcoming someone to a new city. I like that it feels like opening the first page of novel and knowing the story will be good, but not knowing what to expect next. After months of video chatting, it was great to see more than Jason’s face on my iPad screen. On the bus ride to Taksim Square, I shared stories about my visits with his friends in Israel as he took in his first views of Istanbul. Before Jason arrived, I had two days to explore the city, so I felt comfortable getting around and we had a great apartment hotel where Jason could make his own space. The food is Istanbul is generally* very cheap. We shared our first meals together…about $10 for both of us, hung out drinking tea, visited the grand bazaar, and walked along the busy streets of Turkey. We were quickly walking in the groove of partners. We enjoyed the power of teamwork to figure things out and a common desire to just absorb the culture without checking a list of places to see. I appreciated Jason’s kindness to people we met, desire to go with the flow, and ability to manage stressful moments with patience and kindness. ** I also appreciated two weeks of turning over some of the things that I enjoy less about being alone on the road like always having to take care of organizing my money, carrying my suitcase down long staircases, and watching where I walk in traffic. I have never been so happy to free my brain from these things for a few weeks. While waiting for Jason, I did a bit of research on church services we could attend on Sunday and found an English/Turkish service at Nations Church. When I sent the email requesting service information, I received a quick response from their Pastor Peyton Harris who invited us to dinner when Jason arrived. How cool is that…a crew to help welcome him to Istanbul-like an international example of “knock and the door will be opened.” Peyton and his wife Clover are from Virginia and moved to Istanbul to plant a church. We enjoyed a Turkish dinner with them and a few of their friends. We were all quickly comfortable and we learned a lot about life in Turkey. The days in Istanbul were rainy and kind of quiet…a few sights, tea shops, and lots of eating. I forgot…generally men need more to eat than my standard one meal and snacks, and for some reason, if I am at a restaurant…even if I am not hungry, I will eat. So I did…a lot! I ate more in those two weeks than I have for the past month. Different cities tend to have their own personalities, and I find Istanbul to be a rather serious place. People walk around…rarely smiling and don’t offer general niceties that I have come to expect in places like South America, Africa, and Nepal. People bump into you without an excuse me, crowd in line, and seem very reluctant to interact with strangers. It might just be my experience, but that’s all I have to form my impressions of a place. People are not necessarily unkind, but don’t seem particularly outgoing either. After the first few days in Istanbul, and a short bus to Ankara, we boarded a plane for Erbil, Iraq. Erbil has been on my heart since hosting friends Aamr and Ali who were chaperones for the Iraqi Youth Leadership Exchange Program hosted by World Chicago. Two and a half years ago, they visited Chicago and we spent a lovely two weeks exploring the city together. They gave me new insights into Iraq and I aimed to give them many experiences with friends who served as Chicago’s citizen ambassadors. Aamr assured me that Erbil was a safe city in the Kurdish region of Iraq…his stories of beautiful architecture, family outings, and safe conditions were so different than my perceptions of Iraq that I was intrigued and wanted to visit. As a soldier, Jason spent a year deployed in Iraq and had imagined visiting again to travel through Kurdistan. We learned that many Kurds hold an affection for George W. Bush and American soldiers who liberated them from the atrocities of Saddam Hussein’s regime. Aamr was an excellent host from our first minutes in Erbil…picking us up at the airport at 3:00 am! We immediately had warm feelings about the people we met. The hotel staff was friendly and as we walked the streets, people were gracious and outgoing. The food was delicious! We enjoyed delicious chicken kebobs… a few times and enjoyed the plates of salads, hummus, and bread. Near the oldest inhabited residence, The Citadel, we wandered and bought fresh squeezed pomegranate juice for about a dollar. 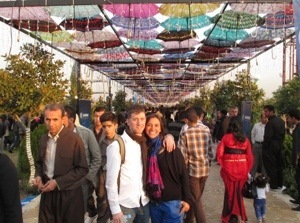 During our visit, Erbil celebrated Newroz-the Kurdish New Year. On our first night, there was a 1st Annual Dance Party around The Citadel. The intent of the party was to break a world record for the most dancers, but for the first attempt, most people were dancing in small groups instead of joining as one complete circle. They will try again next year. The area surrounding The Citadel was packed…with tons of men and very few women. There were a few clusters of women…but when I turned my head, there was rarely another woman in sight. We had a rare opportunity to visit a World Chicago contact who works at the American Consulate. Although Erbil is very safe, our government has a “One Iraq” policy so conditions in the Consulate in Erbil are identical to those in the Embassy in Baghdad. That means that the staff must live on the Consulate grounds and cannot even cross the street outside of the walls to get a cup of coffee. They work, eat, and socialize with each other only…every day for their one year terms. If employees have business outside of the Consulate, they must travel in bulletproof, secure cars with their own security team. It seemed intense! Our hostess was an interesting woman. When we asked how her family felt about her placement in Erbil, she said they were thankful because one of her recent terms was spent in Baghdad. She treated us to lunch within the compound using “fake money” that is given to her for food each month. Most of the people on the sight were security…big burly guys protecting the property. For example, when we first arrived, we had to be confirmed from a list of guests, hand over our passports and cell phones, and have our bags searched. When we stopped at the Consulate grocery store before leaving, our hostess pointed out that the owners clearly knew their clientele…there were shelves lined with protein powders, vitamins, and alcohol. I guess you have to find a way to entertain yourself during free time when you are confined to a small living space. Our second Newroz festivities were energetically fun! The government of Erbil hosted a huge party in a local park with live music, a few speeches, lighting of a ceremonial fire, and a great firework display! People were having a great time celebrating Kurdish pride. They have had recent hardships…awful atrocities against the Kurdish people…and on this night we could appreciate their resilience and feel the great pride in their culture and region. The days in Erbil were just the beginning of our memories in Northern Iraq. I am sure of that. We connected with Aamr and Hussein who were World Chicago friends and met new friends, too. We enjoyed a sunny afternoon of tea outside of The Citadel with our new friends Botan and Kamaran and feel sure that we’ll see them again, make new connections, and spend time exploring other areas outside of Erbil. On our last day, we basked in positive thoughts about our time there, talked about future dreams for the area, and casually enjoyed meals and time with our new friends. We felt relaxed and blissful as Aamr and his daughter Soz drove us to the airport for our 4:50 flight back to Turkey. Now mind you…I have taken over 50 scheduled plane, train, and bus rides in the last right months and have never missed or been late for one. I KNOW THAT A TICKET THAT WITH A FLIGHT TIME OF 4:50 IS AN EARLY MORNING FLIGHT! But…as I reviewed the ticket at least ten times…my head made plans for an afternoon flight with a busy morning of activities. We arrived at the airport and said our goodbyes, when Soz decided she would like to come into the airport. Thank God for Soz because as soon as we looked at the departure board and did not see a flight listed for Turkey, it came crashing down on my mind that our flight left at 4:50 am and I knew that the next flight on this airline left three days later. These are the moments that define a trip…define a relationship…and set the stage for future events. I felt blessed when Jason gave me a “hmmmm” look and calmly worked with me and Aamr to brainstorm other options. Aamr stepped up as our hero who found us an overnight bus to Turkey…eight hours scheduled… actual 14 hour trip. Jason got online and built us a new itinerary…Bones did her magic in response to our text for help and found us a hotel in our new destinations…and I got to appreciate all of them without feeling judged by anyone but myself for such a ridiculous mistake. We spent our next days in Turkey hanging out in Ankara, Ephesus, Izmiri, and back in Istanbul. Ephesus was especially meaningful…imagining Paul and the early days of the church there and having familiarity with the Ephesians. As we prepared to return to Istanbul, we sent a message to a new friend we met at our hotel there and invited him to lunch with us. There was something special about this guy. He had a positive nature, felt honorable to us, and it was fun to chat and learn about his dreams of coming to the US. moment. We visited a restaurant on the Galata Bridge and ordered a few salads, three huge shrimp, a beer for each of them, and chose a fish from the platter presented. The meal was fun and delicious. The fish came out on a huge tray…a big one…the fish was big enough to have teeth and fed all of us! I knew the meal would be more expensive than the $10 for two meals that we had been enjoying for our entire trip, but wowsa…the bill came and we signed it…and only later did it hit us that we just paid $250 for lunch. Yes…I am not kidding! That was more than we paid for all meals combined to that point. Jason and I were not sure what to think…we felt bad because we were not savvy and were so into enjoying our time that we just went with the flow and spent way too much money. Before we could even reconcile that in our hearts, we stopped at a hamam or Turkish bath. Now me…I like them…I am used to them…and didn’t even think that this might not be something a guy might enjoy…until I saw Jason’s face when he was finished and heard his lament about what an awful experience it was! What?? Rick Steve’s liked it! I just can’t repeat Jason’s story with same flare that he tells it, but I can say that I am sure he won’t be visiting another hamam in his lifetime. A crazy expensive lunch…a traumatic hamam experience…this was not exactly how I imagined our last day together! As the evening proceeded, and we sat on the couch watching tv and tending to our small wounds, I recognized the fact that we both have the ability to appreciate the blessings of these bumps in the road. We agreed in thinking…Heck…if our worst robbery of the week took place over a delicious lunch, that was better than an armed attack. And these experiences gave us a chance to know each other better and practice on the spot problem solving…maybe avoiding future conflicts. And I definitely learned that Jason does not enjoy a scrub down from a stranger…that’s good to know! In general, I think Turkish men may pamper themselves a bit more than they do at home. Jason’s simple hair cut turned into a hair conditioning treatment with his head wrapped in foil and sporting a green mud mask. As I sat watching all the men at the barber shop with drying mud on their faces, I could only imagine the reaction of some of my friends at home. A simple shave became so much more. He was shaved, cologned, rubbed, and powdered all in the name of facial hair removal. At one point, the barber took out a flame and used it to burn stray hairs off his face. I swear, I never knew what to expect as I sat and watched these pampering extravaganzas! The return to the airport to drop him off was not as fun as the arrival. I wished I could start the whole adventure over. I have not felt lonely on this trip, but I was thankful Bones was on her way to Turkey to join me for two weeks because this probably would have been the moment when I longed to board the plane home. But now…I am back on a bus-filled with new dreams and visions for the future…that is an amazing place to be! Three months to go..two weeks in Turkey, two weeks in Israel, and two months in Italy before coming home! How will I ever get back into a normal routine? This entry was posted in Iraq, Kurdistan, Travel and tagged Erbil, Iraq, Kurdistan, Travel. Bookmark the permalink. 2 Responses to Iraq? Sure, Why Not? I love this. You are such a great story teller, and as I read I add places to my list of dreams! Thank you for your story’s. And I must say that being able to travel together says a lot about a relationship. I always love travelling with Trevor, we are good at it, haha!